The Sprint-powered network has just added this 4.5-inch 4G LTE Android handset to the portfolio and sells it for only $99 USD. Sprint-powered Boost Mobile has a rich portfolio of products that consists of low-cost smartphones, all free of contract and capable of offering a rich set of features for their price. 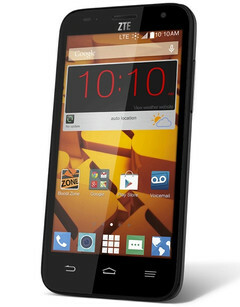 ZTE Speed is a brand new smartphone that has just been added to the Boost Mobile lineup and it is worth pointing out that this Android handset offers 4G LTE connectivity for less than $100 USD. Boost Mobile offers the ZTE Speed 4G LTE smartphone for only $99.99 USD via its website since yesterday, but it will not hit the carrier's stores earlier than January. Richardson, TX, December 23, 2014— ZTE USA, the fourth largest smartphone manufacturer in the U.S. and second largest in the off-contract market*, today announced the availability of the ZTE Speed for only $99.99 (excludes taxes) off-contract with Boost Mobile. Fully equipped with 4G LTE, Android 4.4 Kit Kat, a 4.5-inch display and Quad-Core processor, the ZTE Speed is seemly expensive, but none will be the wiser. With minimal up-front costs and maximum savings with the unlimited Data Boost Plans from Boost Mobile, holiday shoppers are able to save money without sacrificing the quality of gifts they are giving. The ZTE Speed lives up to its name. Pure Google Android Kit Kat without bloat ware, Enhanced LTE connectivity and 1.2GHz processor gives this phone lighting fast power and capabilities. The study yet sleep design with 4.5” display allows uses to also live their live their fast-paces lives by catering to easy one-handed navigation and portability. The Data Boost Plans provide an affordable way for consumers to match their specific data needs. At $35 per month, Boost Mobile provides one of the lowest prices for an unlimited talk, text and high-speed data prepaid plan among major carriers. For more information on the Data Boost Plans visit www.boostmobile.com/databoost/?ECID=PR:REL:20140903:databoost_announcement. ZTE USA (www.zteusa.com) is a subsidiary of ZTE Corporation, a leading global provider of mobile handsets, telecommunications equipment and network solutions. Operating since 1998, ZTE USA is dedicated to making cost-efficient, quality communication technology accessible to all. The company provides a magnitude of devices to every major US-based carrier, generates over $17.4 billion dollars’ worth of business for US-based companies and devotes more than 10 percent of its revenue to R&D. ZTE USA is headquartered in Richardson, Texas and operates 17 sales offices, customer service centers, R&D and distribution facilities across the US. ZTE is ranked as the country’s fourth-largest supplier of mobile devices overall, and second-largest supplier of prepaid devices, by independent analysts. ZTE is the Official Smartphone of the Golden State Warriors, Houston Rockets and New York Knicks. Visit ZTE USA on YouTube https://www.youtube.com/user/ZTEUSAInc, LinkedIn https://www.linkedin.com/company/zteusa, Facebook https://www.facebook.com/ZTEUSA, and Twitter https://twitter.com/ZTE_USA. Boost has no annual contracts; services subject to certain terms.